Spring is definitely in the air, so a thinking person begins thinking about Butterflies, Brains, and other natural wonders of our lovely little planet. So it was, that I stumbled onto the American Museum of Natural History while eating lunch at my desk a couple of days ago. This is a well established and well funded cultural and scientific institution, with its physical location in Central Park, New York, and a most impressive and interesting history — dating back to 1869. Unfortunately, some of their web pages also date back quite awhile, as you can see by taking a quick tour of the Museum’s website. 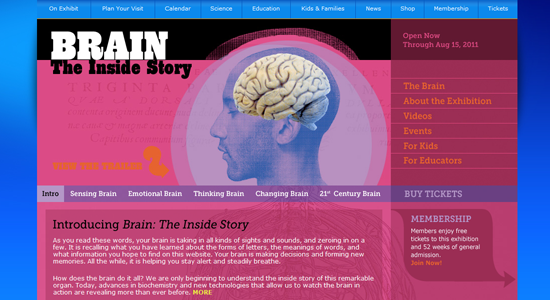 Always on the lookout for beautiful examples of Virtual Musea to study, I was immediately drawn to a current exhibit titled Brain: The Inside Story. This section of the website was clearly designed by a professional, and employed strong colour and type choices that would definitely appeal to a younger audience — such as the grade school students they were trying to attract. The text and graphics conveyed impressive energy, and everything was well laid out, easy to read, once the eye adjusted to the ‘adventurous’ colour choices employed by the designer. The more I clicked around, however, the experience became gradually more unsettling, as the entire interface (including layout, navigation and colour) kept changing, creating a sense of vertigo, as if every section represented a completely different organization. It’s one of the most scrambled examples of web evolution I’ve ever seen, both visually and technically. Some of the videos are smoothly integrated, but many are dependent on some other browser plugin that makes them awkwardly inaccessible. Here’s hoping that their budget allows for a complete remake of all the older pages, otherwise the only way to visit this excellent museum would involve travelling to New York to visit in person. Compare the Brain and the Butterfly for yourself, yuk! Website re-design is definitely a necessary process in this day and age, but obviously the transition presents challenges for both the organization and the website visitor alike. Good read, funny and informative. I appreciate it, we’re going to New York this summer and will definitely visit this museum.